KTM IS hailing its new 1290 Super Adventure as the perfect combination of travel enduro and luxury sports tourer. That’s a bold claim and one that I suspect a certain BMW R1200GS will not be best pleased with. 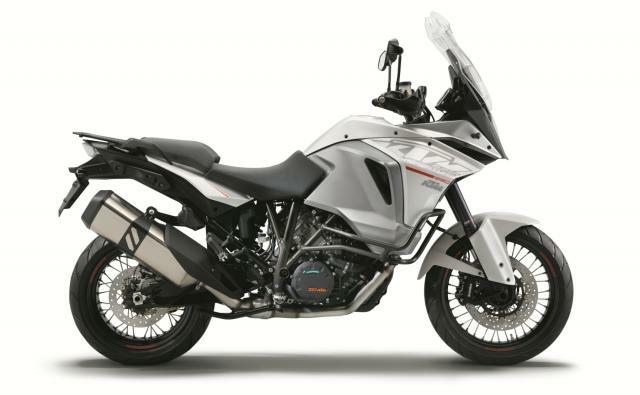 The 1290 sits at the top of KTM's Adventure line-up as the firm’s new flagship travel model ahead of the existing 1190 Adventure and the also new-for-2015 1050 Adventure. It’s got the 1301cc V-twin engine from KTM's lunatic 1290 Super Duke R but has a new crankshaft, cylinder heads and revised mapping to bring power down from 180hp to 160hp. It makes 77.5lbft of torque just above idle and goes on to produce 103lbft at only 6,750rpm. That’s a lot of grunt across the rev range and puts it in a league well above and beyond BMW’s liquid-cooled boxer engine. It’s also got just about every toy you could ever think of, including semi-active electronic suspension, cornering ABS, traction control, cruise control, heated grips and heated seats. It’s like an extremely safe missile. With a furnace. The Super Adventure has presence too. Those sharp angular lines at the front cutting into the bulbous fuel tank give the bike an assertive stance and an immediate impression of touring potential. Every part of it begs you to sell your house, give up the kids, and go in search for the meaning of life on a round-the-world trip. Or something like that. I have to admit I felt somewhat unsettled before riding the 1290. 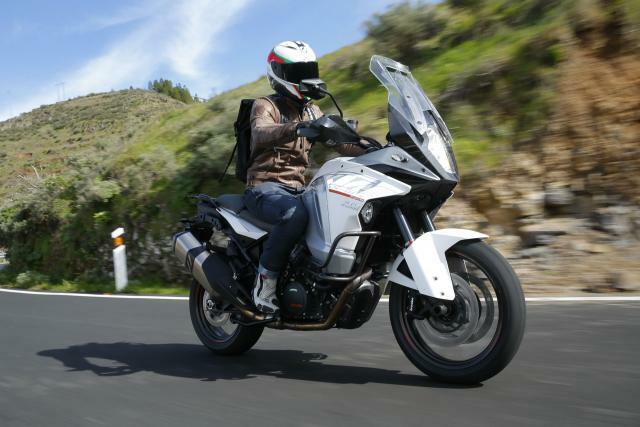 You see, the 1190 Adventure really is a perfect combination of travel enduro and sports tourer. It does everything and it does it well. I feared the 1290 would be a compromise too far - perhaps a bit too heavy, a bit too touring focused and not enough ‘Ready to Race’. Well, it might not be as orange as I’d have liked, but the Super Adventure is still very much a KTM. Despite its 249kg wet weight, the 1290 is light on its feet and has the most impressive suspension set-up I’ve tested on a bike of its kind. The electronic damping system soaks up even the largest road imperfections without numbing feedback from the tyres. It feels seamless and preemptive, unlike some other systems which can occasionally lag a couple of steps behind. I left the bike in Street mode but damping can also be adjusted to Comfort, Sport or Off-Road mode. Although there’s a noticeable difference between the set-ups, I suspect the majority of owners will pick a setting they like and rarely change it. 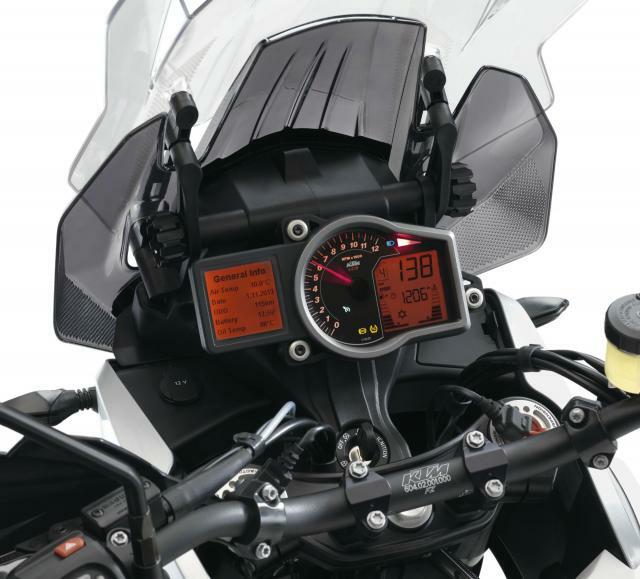 Suspension pre-load can also be adjusted electronically and takes only a few seconds to tweak through the bike’s on-board computer. 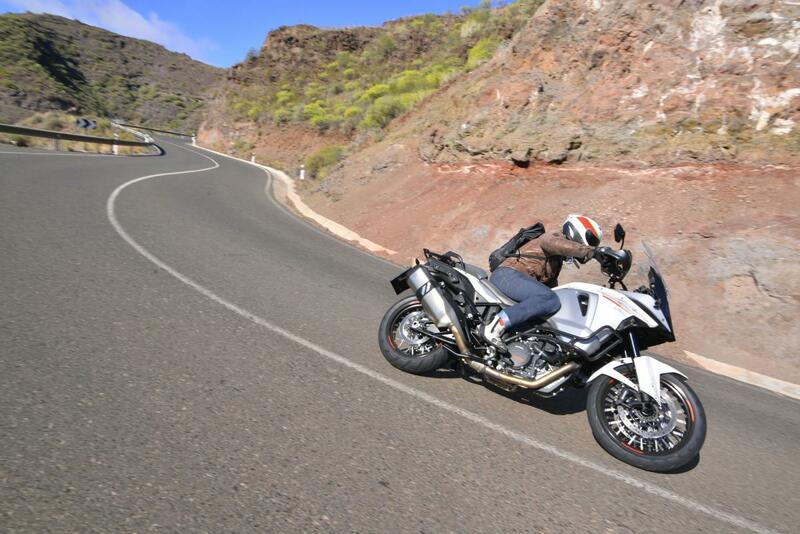 Sharing the exact same frame and swingarm as the 1190, the Super Adventure is perfectly at home on a twisty road. The 1290’s front end feels completely planted through corners and at high speeds - a nice trait given that most big ‘adventure’ bikes tend to have wide bars, a narrow front tyre and geometry which doesn’t always lend itself to front end stability. It always amazes me how aggressively you can chuck a KTM Adventure through a corner and still come out the other side thinking ‘I probably could have gone faster.’ Although that’s not particularly surprising when you have 160hp and endless amounts of torque to play with. 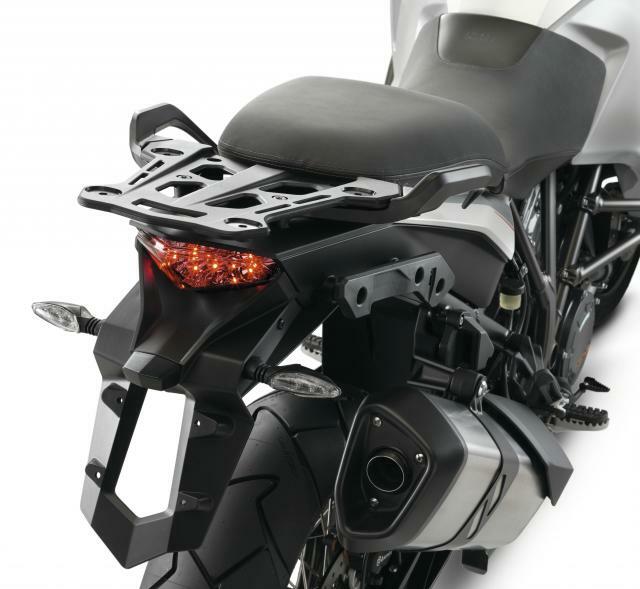 As in the Super Duke R, the smooth engine is meaty with plenty of top-end punch. However, with slightly shorter gear ratios than the Duke, power is never overwhelming and on dry roads there’s generally very little intervention from the TC system, even in the Super Adventure’s most intrusive riding mode. If a bit of rear wheel movement doesn’t phase you, the 1290 also has a Sport riding mode where traction control ‘intervenes in a safe and sporty style at a late stage’. There’s also a Rain and Off-Road mode. Both limit power to 100hp but the latter allows you to spin up the rear for a bit of controlled (or uncontrolled) sliding on loose terrain. The system can also be turned off entirely if you ever feel inclined to pop a wheelie, something the 1290 is most certainly capable of. Braking is carried out by a radially-mounted twin-disc four-piston Brembo set-up at the front and a two-piston Brembo caliper at the rear. There’s not a particularly strong initial bite, just progressive power that’s predictable, working in conjunction with the combined-ABS and ‘anti-dive’ front end, which firms up when you give the brake a handful. On several occasions I could feel the cornering ABS at work, chirping away through the front brake lever - limiting braking to what I actually needed, instead of what I thought I needed. 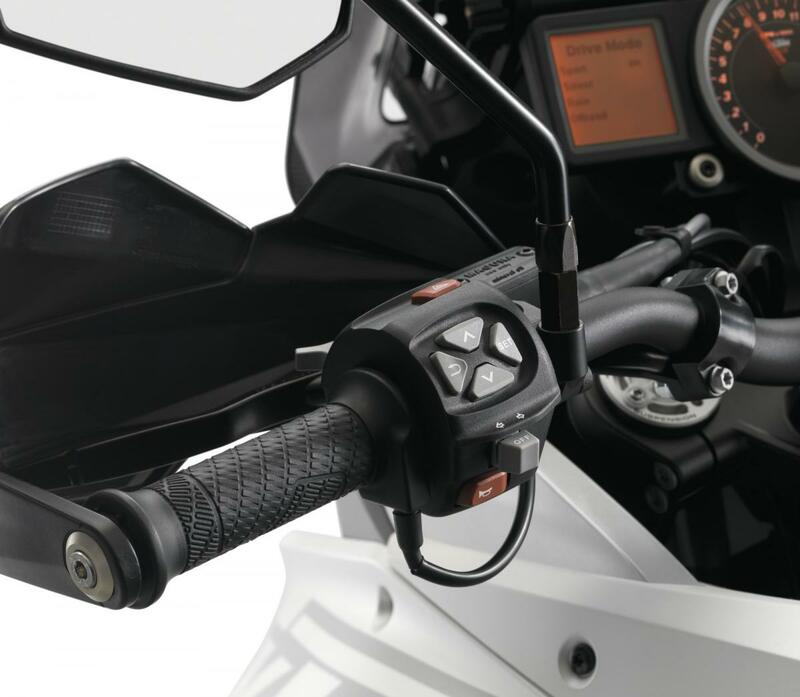 On the other end of the handlebar is a Magura hydraulic clutch lever with a featherlight action that compliments the smooth gearbox. I didn’t miss a gear all day but couldn’t help thinking that KTM missed a trick by not fitting a quick-shifter. They provide such seamless shifting that their use extends well beyond sports bikes hunting for a few extra tenths on track. In keeping with KTM’s ‘luxury sports tourer’ claim, the Super Adventure has some innovative features that enhance its globetrotting credentials. It has clever three-stage LED cornering lights tucked into the fairing, which light up in sequence as lean angle increases. There’s an adjustable screen, an integrated 12V socket, a tyre pressure monitoring system, self-cancelling indicators, spoked wheels, pannier mounts, engine crash bars and a centre-stand. You also get heated grips - which didn’t get quite as hot as I’d hoped for - and a heated seat that will thaw any frozen bum cheek in a matter of minutes. Combined with the pulse of the 1290’s V-twin, I suspect female passengers will appreciate the heated pillion seat. Even if it does leave them a bit sweaty and cross-eyed. An adventure bike is nothing without a good range and the 1290 Super gets a completely new, continent-crossing 30-litre capacity - seven litres more than the 1190, giving a claimed range of over 300 miles. The 1290's wide birth also serves to deflect wind and bad weather away from the rider’s legs. After a 130-mile ride, most spent exploring the rev limiter, my test bike showed it had gone through just over half a tank. Perhaps the Super Adventure’s biggest weakness is its chain-drive. 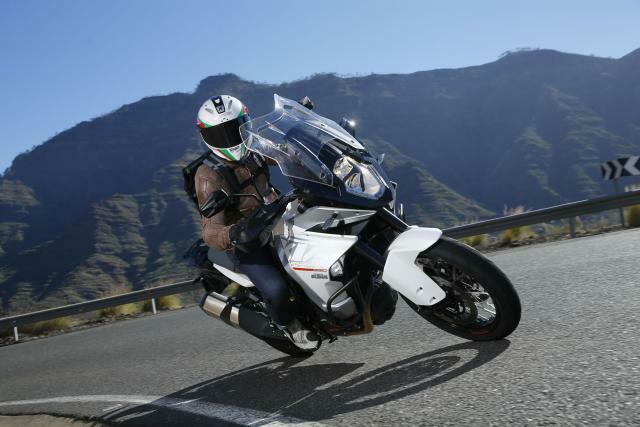 I have no doubt it offers a more engaging and sporty ride but a part of me thinks it’s likely to put off a number of customers deciding between the KTM and the GS. And I want them to buy the KTM. They should buy the KTM. I have no doubt the 1290 is a far more capable and accomplished machine than BMW’s Adventure. Purists will no doubt say you don't need a big touring bike to travel the world. They're probably right. 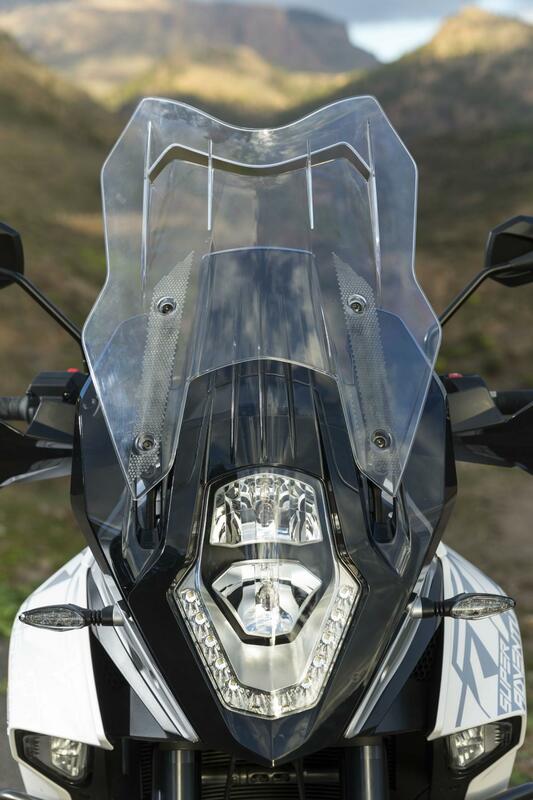 But have a go on the new Super Adventure and I suspect you’ll never want to look at a KLR650 again.